Miracle of all phones running fantastic. Does anyone know if it will be possible to run android-applications on N9? I heard some rumours about a Myriad Alien Dalvik application that would make this possible. Is this app available only for developers, or will regular users be able to download the app, and then purchase apps directly from Android Market? AnonD-252, 20 Sep 2011You desperate Nokia-fans troll everywhere, and in the comments for every phone, and you always... morewho says we are desperate? I am telling you if youdon't like nokia it is your choice! you nokia haters are the worst trolls i've ever encountered on gsmarena. This Nokia N9 should come with super enchanced fixed focus 8mp camera. Auto focus cameras are outdated. AnonD-252, 20 Sep 2011You desperate Nokia-fans troll everywhere, and in the comments for every phone, and you always... moreYou look so highly on Andriod. Are you aware of what's happening to Andriod and Apple lately. If not, i think Samsung does. Samsung is planning to make Bada OS an open source, which most likely they will shift from Andriod to Bada due to the on-going patent suits between Andriod and Apple which really affects their market on Major Countries not only months but may take years before it will be settled. And if Andriod is causing them so much loss of money, they would definitely drop the Andriod and use another OS. is n9 better than n8? 1)who need external sd card when we have 64gb. 2) n9 have radio hardware/ need software.... meego is that much cheap like they cant put a simple software in device. user have to download it. many n8 lovers i seen around galaxy s2 thread. it has 3 buttons at the side 1 for locking the phone and the volume up and down. 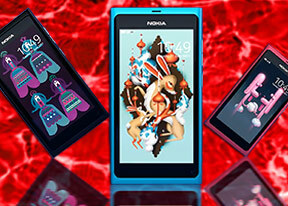 how much is the price of nokia n9 pre order? carlo, 20 Sep 2011to all these nokia haters & android/smmy lovers (most trolls are sg2 users).. u don't just... moreYou desperate Nokia-fans troll everywhere, and in the comments for every phone, and you always troll on every new article on the gsmarena first page, so stop complaining when others do the same on your pages. Your trolling on every other phones comment-pages, where you always lie about how good N9 or N8 is, does ofcource make the readers visit the pages for N9 and N8 to find out what all the fuss is about, but when they are here they can not resist commenting your many lies about Samsung-phones, and they can also read the many negative comments from disappointed N8... users. N9 have MeeGo, but the hardware-specs are not much more "impressive" than the year old hardware-specs of Samsung Galaxy S1. MeeGo can still not support the N9 FM-radio, and it can still not support full Adobe Flash 10.3 and no sd-card and no... MeeGo is a new os, but when all the initial hype is gone and user become frustrated because of not enough good apps and not enough official support from Nokia and... then buyers will lose their intrest in MeeGo and return to Android..., just as they lost interest in Maemo. Dream phone. When can I buy it in Moscow? AnonD-13986, 20 Sep 2011Please see the previous 10 to 15 pages, you will see who post more. I think it's at least 3rd ... moreto all these nokia haters & android/smmy lovers (most trolls are sg2 users).. u don't just get it, we nokia users do not care really what you want in life, if you want android phones, smmmmyyysss or anything else... it's your choice and it's your monies..so feel free to spend and buy what you want.. it's yours! but you guys always try so hard to desuade us from buying what we want. if we want nokia well of course it's our choice. nevertheless, nokia still is our choice..whether u like it or not. Anonymous, 20 Sep 2011i see who is screaming that guy sent 2 post and you sent 6-7 Please see the previous 10 to 15 pages, you will see who post more. I think it's at least 3rd time I reminded that he need not be sooo concerned about what model other people want to buy as he's not buying it anyway. I dont care what brand or model other people wants to buy since they are not using my money to buy. Anonymous, 20 Sep 2011just a normal phone. it will do same thing which n8 is doing till now. even less( usb otg is ... moreotg removed , camera less mega pixel, world is living in 1080p full HD. its still in 720p. nokia stop making replica with adding 1 basic advantage. this phone support divx xvid files..usb OTG..? ?